Today we released Windows 6.17 beta 3. It's available here! When creating a note by using a template function, I get the "Note created from template" box on the bottom of the note. In Beta 2 of the Evernote 6.17, when I get this box, it had a downward progress bar on the bottom of the box which made the box disappear after a time. Now, it just sits there. The only way to get rid of this box is to switch to the different note and then come back to the note I am currently working on. 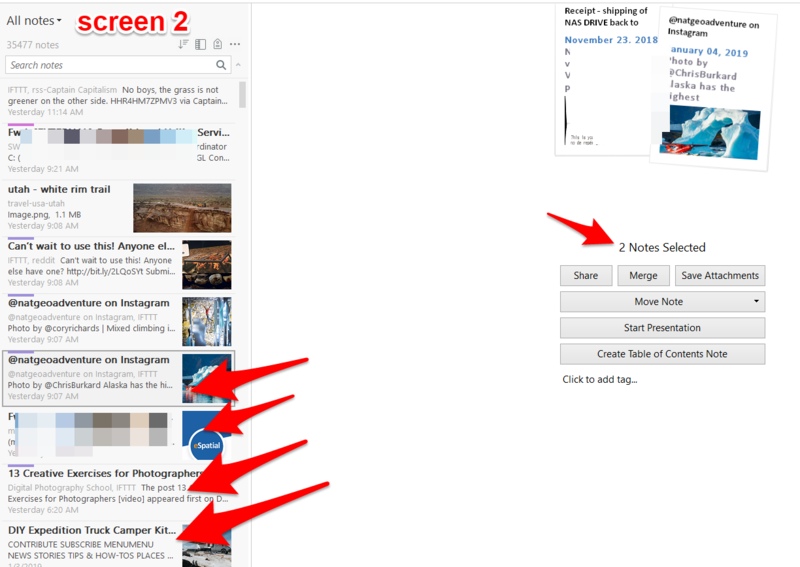 And another thing: Can it be possible to add an option to make a template open to the "my template" section of the templates gallery instead of the gallery itself? I thought that "paste and match style" had been settled. Beta 2 was fine but with beta 3 I never know just what will end up on the page or where it will end up. Pasting what used to be plain text now requires that I paste into Notepad first and then copy from there. Beta 2 didn't require this. "Attach file" seems to just put the file or image wherever it thinks it might fit. The cursor is blinking away where I want the attachment to go but it may end up 6-inches down the page or it may jump to the top. I find the only sure-fire way to get an image on the line I want it is to open the image in some other program and copy it to the clipboard. Then I can paste it in my note and it goes where I want it. I just noticed my Chat font is rendering an 8 point which is very small. Is there a way to control the font size in chat? I can confirm something is not correct with pulling in templates and then putting them in your personal directory. As noted, you have to leave the note and come back. Images work best it put in a table. However, adding a table to add an image is a set of steps that I would like to avoid. I think someone has posted this before but didn't have any way to always replicate. I've found a way that seems to always replicate the bug consistently. My steps to replicate might be a bit more than necessary - but this is a regular part of my work flow - so I see it quite a bit. Some 'oddness' does follow in screen 2 which I'll explain after the replication steps. step 1 is click to run saved search 'current reminders'. step 2 - is optional - I later tested on other notes where I didn't need to filter a search - but my search for 'canada' gives me a note with a second note link - this is what is critical to duplicate the 'notes being selected' bug (for me anyway). step 3 - click the note with a second note link. step 4 - click that note link. You'll be presented with the screen posted above - where the two notes are now selected - this is not my intended behavior - but Evernote is acting as if this is what a person wants. Below is the strangeness in the action of this 'two notes selected' bug. The two notes are 'selected' - the note clicked on via the note link in step 4 above - but a "not so random" second note is selected. What is really strange is the second note selected changes each time - in my note list below it started at the bottom note and works its way up. Anyway... hopefully someone takes note and can fix this... for me in my work flow, it's quite annoying as it occurs quite often - but it happens so often I deal with it... for some reason, tonight I just spotted the pattern to replicate. Bug Report: *DATA LOSS* Can not "undo" (ctrl-Z) if editing a pre-programmed field in a business card scan. example: I accidentally pressed a key while copying a phone number. It erased the field and placed the letter I accidentally hit - could not control-z to undo. had to manually re-enter the number. Can not use menu to undo as well. I've labelled this as a data loss issue because if you don't have the information in the business card scan to re-enter into the form field, the data is essentially lost at this point - although recoverable through note history. Another minor annoyance - why do new note templates now open with a default to the All Templates view, and I have to choose the My Templates tab to get to the ones I use the most? The Evernote templates are nice, but the ones I made are essential (and in most cases are more likely to be used on a daily basis). Please at least save the preferred tab order so I don't have that one extra mouse click every. Single. Time. I create a new template note? Don't know whether it surfaced in a recent version, but I've just woken up to the fact that from a Premium account, I can now open another (Basic) account in another window, which insulates me from the first account going bye-byes from time to time. In fact both together are better behaved than the Prem account on its own. When the main account freezes I get lots of disk activity - Evernote pops to the top of the list as heaviest user of access. It was pointed out elsewhere that the two instances are separate, and the second one continues to operate. More than that, it's possible to move a note (or bunch of notes) from one account to another by drag-and-drop, so the second account becomes a useful workspace while the first counts butterflies and admires the flowers. BUT why oh why oh why - such a big, horrible, Duplo icon!! I've been playing with that myself the last few days. Works well until you need to sync. I've been sharing notes as well from my "Premium" to my "Plus" account. I don't know the exact reason but it seems a tad slower than even OneNote when it comes to syncing. OneNote can, on a good day, sync 40 notes in five minutes. Granted I'm only running 8 cores for a CPU and a Samsung EVO SSD for storage. This sharing between the Premium and Plus, for the same 40 notes, has been syncing for a bit over 13 hours. If I try to exit I get dire warnings so I've just let it go. Must be a Windows thing like the business card scanning that doesn't work and the PDF search that doesn't work. I'm not really surprised that sharing doesn't work either. I'm thinking that perhaps when it comes time for my credit card to be charged for the renewal I should be like Evernote and say "It doesn't work." Ouch! I'd suggest you check the server copies of your accounts at Evernote.com to find out where those notes are, and then kill the processes if necessary to get back control. I have nearly 45k files in the Premium account, and less than a dozen in the Basic account, and if I drag files across between active windows they're in place immediately, and the next sync takes seconds or a couple of minutes depending on the size. It works well for me! Classic YMMV. Not sure what's going on with your setup, but it might be an idea to talk to Support while you still have your premium status - that takes a while too, but they are (mostly) helpful. OneNote can, on a good day, sync 40 notes in five minutes. Granted I'm only running 8 cores for a CPU and a Samsung EVO SSD for storage. ?? Syncing isn't a CPU-bound process, or at least it shouldn't be. It should be I/O bound, and # of CPUs shouldn't matter a heck f a lot, if at all. Is Task Manager/Process Monitor/whatever showing a lot of CPU activity when you sync? Are multiple cores involved? I guess you might have things threaded so that you can do any required format conversions as synced notes are processed, but that's going to be a lot faster than the disk and network IO required to do the actual sync and storing operations. Am I missing something? I'll have to check this scenario at home, where I can experiment with my two accounts safely. As noted above, I'm using both a premium and a basic account to work around some issues with the main account. Just a suggestion for Template development - I can save templates on the main account, but can't access or create them on the basic account. It would be a nice-to-have if templates could be shared between accounts so I have access to a central library rather than the current one-sided use. In fact I do have a central library now of ENEX files with my 'standard' templates for both accounts which are accessible from both. That was a really good feedback and we were able to implement in time for GA release. It went live yesterday.